My, it's looking a little dusty around here, where has the time gone? I did not intend to be away so long and now my voice feels rusty, after a blog absence it can be daunting to step back in, I find I need to test the water gently. A tiptoe if you will. A few words today and more tomorrow. These last few weeks have been heavenly though. The sun has shone here in Suffolk, the wisteria drips purple blooms from the kitchen roof, the bluebells fill the woods. There have been meals taken outdoors, bicycle rides, A&E (that boy, that boy! ), chocolate eggs eaten and weddings celebrated. And I have added a new cake to my baking rotation. Orange & almond, my new favourite cake, baked twice in the last fortnight. I used the recipe from How To Eat: The Pleasures and Principles of Good Food (Cookery) , one of my most useful cookery books. 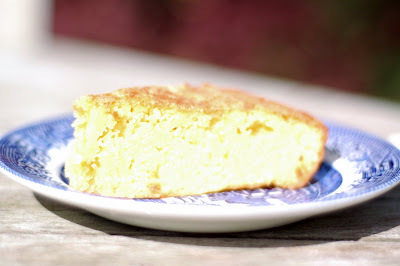 The recipe makes an excellent cake - damp and almondy, perfect with morning coffee, evening tea or even a glass of wine. A grown up sort of cake, understated and simple, it gets better with age. I will experiment though, my bookshelves and the internet reveal many variations upon the theme, it is important to ensure that I am not missing an even better version. That wisteria is absolutely breathtaking! I love the color contrasted with the color of the picture at the top of your blog as well. Lovely! Oh good, you're back! And with tempting cake too - even better! I have missed you! I know it is time consuming to produce such a lovely blog - we are grateful whenever you do! Thanks! Your wisteria pictures are just soooo beautiful, I loved seeing them! I can't wait for the one we planted last year to flower, just have to be patient. The cake looks really delicious too. Orange and almond, that sounds like a perfect combination. I'm not a huge fan of Nigella but sounds like this book might be worth searching out at the library. Love the colour of the wisteria against the wooden boards. And hasn't the weather been glorious? Wind has been deceptively cold though - it was too cold to drink tea outside in the garden yesterday and we had frost this morning in Norfolk! Welcome back! It's a lovely cake, that one. And hasn't it been a wonderful spring for wisteria? We thought ours was giving up last year, but it's done us proud this spring. It has been a good year for wisteria, definitely - I have seen some beautiful ones. I have always been a bit scared of the pruning, so have never dared plant it! What absolutely beautiful wisteria photos, and the cake sounds a goodie too! Welcome back! The wisteria is beautiful. I so wish the sun would shine here. Maybe tomorrow...sigh. Each year I hope my wisteria will look like this !! Your pictures are so beautiful . The cake looks divine too !! With the sun out more and more, it is totally acceptable to miss being on the computer! Your Wisteria is AMAZING! I have an 8 year old wisteria that doesn't flower. I therefore have absolute envy of yours. Thank goodness you have offered me some comfort with that cake. You've been missed. And the wisteria is glorious! Your wisteria is gorgeous, and that cake looks so nice. I must try it. I have been baking a cherry and almond loaf from Nigellas recipies that goes down a treat too.